THE REVIEW: At the end of my review for Mockingjay — Part 1, I remarked that the movie, “is clearly leading into something much bigger, and presumably better.” Well, it looks like I presumed wrongly. Part 2 isn’t a bad film by any stretch of the imagination; there’s no glaring plot holes, you can keep track of the action taking place, and the characters are all familiar. But this last installment in The Hunger Games franchise suffers greatly from the splitting into two parts and being treated like another episode in a TV series. As far as I know, Harry Potter was the first franchise1 to split the last film into two parts, followed by Twilight, The Hunger Games, Divergent, and others. While Harry Potter and the Deathly Hallows had the same feeling of stopping mid-movie and then returning from black for the second film, I don’t recall it being problematic or hurting my impression of the film. The two parts flowed much better into one another and felt complete both separately and as a whole. Mockingjay does not have the same feel to it; the two parts feel disparate. I have a strong inkling that the reason for this may be the increased duration between releases. The final Harry Potter films were released eight months apart whereas Mockingjay — Part 2 was released a full year after Part 1. It may not seem like a lot, and it really isn’t. But for some reason — perhaps a lesser interest in Katniss and co. than Harry and co. — the spread felt entirely disproportionate. Going into the theater, I remarked to my friends that it felt like over two years since I saw Part 1 and the only reason I knew what happened was because I had also read the books. My praise for Part 1 focused a lot on the world building and bringing more of Panem to the big screen. I have always been a big fan of really in-depth adaptations (see: Lord of the Rings) because it allows me to watch a visual representation of what is in the books. Part 2 does hit a lot of the plot points and it gave me flashbacks to reading the book and the twists that are there. But it just feels as if they — everyone involved — ran out of steam. 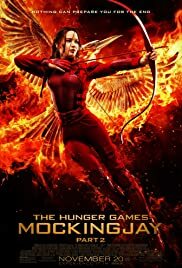 Katniss (Jennifer Lawrence) is pretty blah for much of the film, the little amount of tension that is there comes from action and not from conflict, and once again the amount of filler slows the film to a crawl. THE TAKEAWAY: Perhaps my desire to see more of the world of Panem and the trek to the Capitol to take down President Snow (Donald Sutherland) was the wrong thing to want. The original The Hunger Games is probably the best in the series because it leaves an air of mystery. The characters are more vibrant and the conflict is more tangible than the hatred directed at Snow. Being a completionist however, I couldn’t recommend skipping this film — you still should watch it. And there are some highly entertaining parts to it that makes it worth your while. Although, it could easily use 10 times more Stanley Tucci.